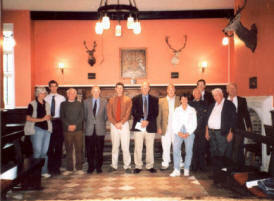 A delegation of members of Dean Forest Voice, The Verderers, the Commoners Association and the Free Miners Association recently traveled to Lyndhurst in the New Forest to meet with the New Forest Verderers and the New Forest Commoners Defense Association. The visit - intended as a fact finding exercise concentrated mainly on the coming threat to Commoning in the Forest of Dean from the Forest of Dean District Council and led by councilor Roger Horsfield. Much useful advice and pledges of assistance were given to the delegates along with contacts in other parts of the country where support may be forthcoming. The visit was considered to be very useful and the delegates from the Forest of Dean were very impressed and grateful for the amount of support and encouragement given to them by the New Forest Verderers and Commoners Defense Association.